Local business owners back a referendum to hike the minimum wage referendum during a press conference in Bangor, June 7, 2016. Last month, about 59,000 workers in Maine got a raise. On Jan. 1, the state’s minimum wage rose to $10 an hour. The increase will result in nearly $80 million in additional wage income, money that will flow through the Maine economy. And, despite dire warning that raising wages would lead to job losses, job growth continued in Maine. Between January and June of last year, an additional 8,000 Mainers found jobs. Employment increased in nearly every industry, including low-wage industries, such as retail, restaurants and accommodations, according to an analysis by the Maine Center for Economic Policy. Despite this, lawmakers are considering rolling back Maine’s minimum wage law, which was passed by voters in November 2016. 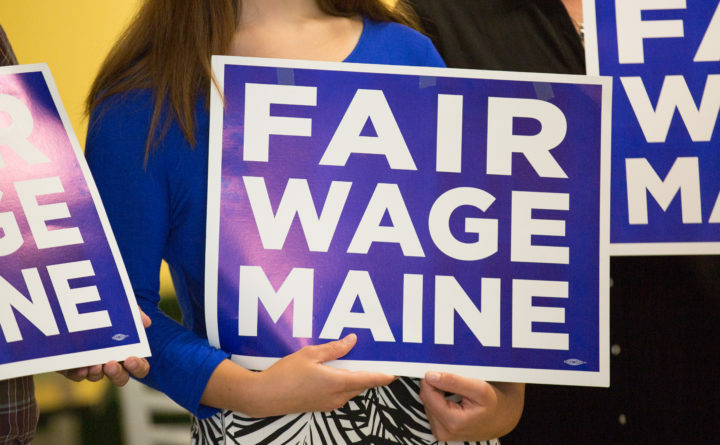 Under the successful referendum, Maine’s minimum wage will be increased by $1 a year until reaching $12 an hour in 2020. After that, the minimum wage will be indexed to inflation. Before the November 2016 vote, Maine’s minimum wage was $7.50 an hour. As they did before the referendum vote, many business owners and business groups are telling lawmakers that a higher minimum wage will doom them. During a public hearing last month, dozens of business owners testified in support of a bill that would reduce Maine’s minimum wage to $9.50 an hour and raise it by 50 cents a year until it reaches $11. The bill would also allow a lower minimum wage for teen workers and a “training wage” for workers between 18 and 20 for the first three months they are on a job. Maine’s summer tourist season lasts for about three months. Those testifying in support of the lower wages warned that the current minimum wage increase schedule could put them out of business. None of them, however, offered data to make the case for this scenario. There are data, however, to show that the minimum wage increase has already helped lift Mainers out of poverty and has put more money into the state’s economy. Given this, it is encouraging that Republicans on the Legislature’s Labor, Commerce, Research and Economic Development Committee have amended the bill to remove some of its most damaging parts — the minimum wage decrease and the end of indexing for inflation. However, they voted in favor of a slower minimum wage increase and the training wage. Earlier this month, the committee voted along party lines — seven Democrats to six Republicans — to reject the bill, which now goes to the full Legislature. There is no reason for Maine to take these steps backward. There is long-standing evidence that increasing the wages of low-wage earners is one of the best ways to stimulate the economy, because these workers spend their money on goods and services. Wealthier individuals tend to invest or save money they receive from raises or tax cuts. Every extra dollar that goes to a low-wage worker creates $1.21 worth of economic activity, according to respected economic models. Every dollar that goes into the pockets of high-earning Americans adds just 39 cents to the national economy. That’s why so many economists argue that raising the minimum wage is one of the best ways to boost the economy. Maine’s early experience bolsters this argument. Raising the state’s minimum wage helped the economy and low-wage workers. Reversing these benefits makes no sense.